It’s time for another checkpoint on my pop music odyssey. It has taken quite a few months for me to navigate this stretch, but here I am, safe and sound. This portion of the odyssey has included 12 records from Van Morrison, 8 from Neil Young, 6 from Bob Dylan, 5 from Tom Waits, 3 from Mark Heard, and just 1 (but a good one!) from Leonard Cohen. I also threw in a sampling of 3 records by Nick Cave (Let Love In, Murder Ballads, and The Boatman’s Call). By the end of the 1990s, my companions on this pop music odyssey were getting on in years: Dylan was in his late 50s, Van Morrison and Neil Young were both 55, Tom Waits had reached 50, and Leonard Cohen was in his mid-60s. One might think that their creativity and ambition would be in decline, rock and roll being a young man’s game, and in some cases that expectation is born out. But all of them released at least one pretty great album in the 1990s, and a few of them were doing work at least as good as what had come before. In fact, the music these men made in the 1990s is particularly close to my heart. I myself was 15 years old in 1990, and it was during this decade that I discovered each of these singers for the first time. The years 1991-92, in particular, are a kind of golden dream in my personal history of music appreciation: it was in those years that Van Morrison made Hymns to the Silence, Mark Heard made Second Hand, Tom Waits made Bone Machine and Leonard Cohen made The Future, and beyond the borders of this odyssey they were the years of great records from U2, R.E.M., The Tragically Hip, Lyle Lovett, Sting, Crowded House, and Pearl Jam. For me all of these records have an aura of wonder around them. I know their nooks and crannies. I honestly can’t say if they are as good as I think they are; I can only hear them with my 17-year old ears, and they sound pretty darn terrific. Not that there wasn’t some dross in the mix. Dylan launched his first LP of the decade with a contender for his very worst song (viz. “Wiggle Wiggle”), and his subsequent two records, on which he sang folk standards, were critically well-received but have never done anything for me. It seemed possible that Oh Mercy, in 1989, was to be his last hurrah. But then in 1997 he released Time Out of Mind, which is to my mind his best record since Blood on the Tracks, and, as it turned out, a record which inaugurated a bona fide late-career renaissance that continues, arguably, to this very day. In any case, I’ve loved Time Out of Mind since I first heard Dylan croak out the first line of “Love Sick”: I’m walking through streets that are dead. We understand implicitly that it was his voice that killed everything. Daniel Lanois, for all that he has been criticized for making all the records he produced sound the same, at least managed to get Dylan to record songs with arrangements and texture, something that was too often missing from the blunt-force approach to production that he used through much of the 1970s and 1980s. And “Tryin’ to Get to Heaven” and “Not Dark Yet” rank with the very best of the Dylan songbook. Neil Young had ended the 1980s on a high note, with Freedom, and he opened the new decade with the same raucous noise (only more so). Later in the decade he would team up with Pearl Jam on some blistering rock and roll records. But my favourite records of the decade are the quiet ones: Harvest Moon in 1992 and Sleeps with Angels in 1994, the later being the mildest mannered Crazy Horse album on record, and one of the high points in Young’s discography, a record of rough-hewn beauty, even if it lacks any particularly great individual songs. As is often the case with Young, the sound is more entrancing than the substance. Well, I doubt that one of the best poets would write about mouths laying down, but, still, these lines of his come to mind when I think about Mark Heard, who passed away suddenly in 1992, and who was, I’ll wager, the best songwriter you’ve never heard of. As I said last time, he made three truly outstanding records in the early 1990s, of which the second, called Second Hand, is his masterpiece, and one of my all-time favourite albums. It’s a sort of miracle and a sort of tragedy that an album this intimate and desperate and honest found its way into the world through the “contemporary Christian music” portal; a miracle because the piety of the record, though very real, is not expressed in comfortable or comforting ways, and a tragedy because it didn’t find the audience it deserved. The music is stripped down to a few acoustic instruments, and Heard’s ragged tenor was never captured in better form. Indispensable. Leonard Cohen released only one record in the 1990s: The Future. Despite its hokey instrumentation — it sounds as though it was made with one of those $50 electronic keyboards from Radio Shack — it contains some of his most ambitious songwriting, and he is in glorious sepultural voice. It is fair to say, I think, that it is the most political record he has made, for it contains two epic songs on broadly political and cultural themes (“The Future” and “Democracy”), and though I am normally averse to politics in song I don’t tire of these ones. “Closing Time”, his bouncy apocalyptic number, was a pretty big hit, and I have a very distinct memory of hearing these lines on the radio: “So we struggle and we stagger / Down the snakes and up the ladders / To the tower where the blessed hours chime”. Not much to look at when set down on paper, I suppose, but to my inexperienced teenaged ears, those lines convinced me that popular song could, in the right hands, aspire to be something like art. I don’t remember if I was already listening to Dylan and Waits at that point, but my encounter with Leonard Cohen’s The Future certainly catalyzed my interest in the craft of songwriting. If I’m not mistaken, Hymns to the Silence was the first Van Morrison record that I really got to know. I can still remember reading the review, by Brian Quincy Newcomb, and thinking that I needed to find a way to hear it. It was not at all a bad entry point into Van’s music. The gauzy veil that had hung over much of his music in the 1980s was blown away on this record; everything was crisp and clear, and he was firing on most cylinders. Of course, being a sprawling double album it does have its share of sub-standard material, but they are the exception not the rule, and there are a handful of outstanding numbers. There is even a flute on a few tracks. (It is strange but true that Van Morrison only puts a flute on his very best songs; this is a fool-proof crutch for critics.) And the record contains my favourite rendition of a hymn by a pop music singer: he sings “Be Thou My Vision”. Favourite cover songs: Van Morrison singing Don Gibson’s “I Can’t Stop Loving You” (Hymns to the Silence); Dylan covering Stephen Foster’s “Hard Times” (Good As I Been To You). The bottom five on that list are good, solid records, but the first five are knock-outs. Yes. Here is a YouTube playlist of all these songs. What was the worst of this portion of the odyssey? I can’t say for sure just how bad it is because I’ve never been able to listen to it through, but I’m going to go with Van Morrison’s “In the Days before Rock ‘n Roll” (Enlightenment). I think I’m going to be sick. The worst album has got to be Dylan’s Under the Red Sky (or, under the red sky, if you care about typographical niceties). It is one of the great opening lines, and it is fitting that it comes from one of the greatest novels. I first read Anna Karenina about 15 years ago, and thought that the time had come to revisit it. I am glad that I did. I had forgotten a great deal, and of course the sections about marriage and fatherhood mean more to me now than they did in my bachelor days. In former days—almost from childhood, and increasingly up to full manhood—when he had tried to do anything that would be good for all, for humanity, for Russia, for the whole village, he had noticed that the idea of it had been pleasant, but the work itself had always been incoherent, that then he had never had a full conviction of its absolute necessity, and that the work that had begun by seeming so great, had grown less and less, till it vanished into nothing. But now, since his marriage, when he had begun to confine himself more and more to living for himself, though he experienced no delight at all at the thought of the work he was doing, he felt a complete conviction of its necessity, saw that it succeeded far better than in old days, and that it kept on growing more and more. Stepan Arkadyevitch had not chosen his political opinions or his views; these political opinions and views had come to him of themselves, just as he did not choose the shapes of his hat and coat, but simply took those that were being worn. And for him, living in a certain society—owing to the need, ordinarily developed at years of discretion, for some degree of mental activity—to have views was just as indispensable as to have a hat. If there was a reason for his preferring liberal to conservative views, which were held also by many of his circle, it arose not from his considering liberalism more rational, but from its being in closer accordance with his manner of life. The liberal party said that in Russia everything is wrong, and certainly Stepan Arkadyevitch had many debts and was decidedly short of money. The liberal party said that marriage is an institution quite out of date, and that it needs reconstruction; and family life certainly afforded Stepan Arkadyevitch little gratification, and forced him into lying and hypocrisy, which was so repulsive to his nature. This same process, which I believe is rather prevalent, has been recently treated with some fine insights in Jay Budziszewski’s The Revenge of Conscience. Obviously Anna Karenina is a great novel. I’m very grateful to have had the opportunity to read it again. For no particular reason, I’ve been thinking about music that feints at a conclusion and then carries on. And, to take an example from pop music, here is King’s X singing “We Were Born To Be Loved”; the last couple of minutes are a herky-jerky series of stops and starts. It’s a pretty great song too. I can’t think of any others at the moment. As a supplement to my ongoing pop music odyssey, which, if I recall correctly, is focused around the discography of Bob Dylan, I thought that I would dig out this first (and, so far, only) volume of his autobiography. I’d meant to read it years ago, but somehow never got to it. Well, I enjoyed it thoroughly, needless to say. I would enjoy reading Bob Dylan’s laundry receipts, and the book is a good deal better than that. A peculiarity is that the story he tells skips over the two periods in his career which have attracted the most attention: those years in the mid-1960s when he made that string of brilliant records from Freewheelin’ up through John Wesley Harding, and his Gospel period in the late 1970s and early 1980s when he tossed out his songbook and, for a time, sang only about Jesus. Of this latter period we hear nary a peep in the book, and the former period is alluded to only in a passing reference to his later songwriting difficulties (“I couldn’t get to those kinds of songs … To do it, you’ve got to have power and dominion over the spirits. I had done it once, and once was enough.”). Instead, Dylan writes about growing up in Minnesota, his early days in New York City prior to his first record contract, his personal and professional challenges in the early 1970s, and the recording sessions for Oh Mercy in the late 1980s. It’s a strange selection that must have raised a few eyebrows at the publisher’s house. If one wanted to write about Dylan while studiously avoiding writing about Dylan, one could hardly do better. Still, the book manages to be quite fascinating on its own terms. I learned, for instance, how he got from his real name to his stage name: Robert Zimmermann -> Robert Allen (from his middle name) -> Robert Allyn -> Robert Dylan (after Dylan Thomas) -> Bobby Dylan -> Bob Dylan. 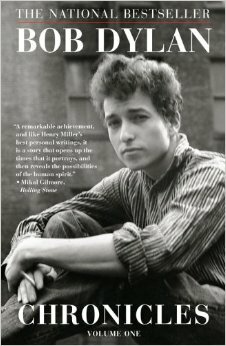 And while of course I knew the importance of Woody Guthrie during his early years, I did not know that the great bluesman Robert Johnson was also a decisive influence — that is, assuming that such claims are actually true; with Dylan, one is never quite certain that the narrative is free and clear of bluff. My house was being battered, ravens constantly croaking ill omens at our door. What kind of alchemy, I wondered, could create a perfume that would make reaction to a person lukewarm, indifferent and apathetic? I wanted to get some. I had never intended to be on the road of heavy consequences and I didn’t like it. I wasn’t the toastmaster of any generation, and that notion needed to be pulled up by its roots. Liberty for myself and my loved ones had to be secured. I had no time to kill and I didn’t like what was being thrown at me. This main meal of garbage had to be mixed up with some butter and mushrooms and I’d have to go great lengths to do it. You gotta start somewhere. I went to Jerusalem, got myself photographed at the Western Wall wearing a skullcap. The image was transmitted worldwide instantly and quickly all the great rags changed me overnight into a Zionist. This helped a little. Coming back I quickly recorded what appeared to be a country-western record and made sure it sounded pretty bridled and housebroken. The music press didn’t know what to make of it. I used a different voice, too. People scratched their heads. I started a rumor with my record company that I would be quitting music and going to college, the Rhode Island School of Design–which eventually leaked out to the columnists. “He won’t last a month,” some people said. Journalists began asking in print, “Whatever happened to the old him?” They could go to hell, too. Stories were printed about me trying to find myself, that I was on some eternal search, that I was suffering some kind of internal torment. It all sounded good to me. I released one album (a double one) where I just threw everything I could think of at the wall and whatever stuck, released it, and then went back and scooped up everything that didn’t stick and released that, too. I missed out on Woodstock–just wasn’t there. Altamont–sympathy for the devil–missed that, too. Eventually I would even record an entire album based on Chekhov short stories–critics thought it was autobiographical–that was fine. The references here are to Nashville Skyline (“a country-western record”), Self-Portrait (“whatever stuck”), and New Morning (“everything that didn’t stick”). The last remark, which can only be an allusion to Blood on the Tracks, I take to be one of the more brazen examples of bluff within these pages. Alongside Chronicles, the Dylan thread of my pop music odyssey has been much enriched by Clinton Heylin’s two hefty volumes about his songs. All of them, you understand, all 600-odd. Heylin, who has written one of the more well-regarded biographies of Dylan (unread by me) and is, I gather, among the more sensible and sober of the (generally slightly mad) Dylanologists, here devotes a page or two (or ten) to every song Dylan is known to have written. I’ve consulted it over and over again as my odyssey has progressed, and I’ve not been disappointed. Heylin is not much interested in interpreting the songs, and although (given how much time he devotes to his subject) he must be a rather fervent admirer of Dylan, his tone is generally flat and factual: he tells us when and where the songs were recorded, when they were first performed live, sometimes discusses alternate takes or alternate lyrics, discusses the circumstances in which the song was written, and gives an overview of how it has fared in his live sets over the decades. I found the books consistently interesting. (I was genuinely surprised to see the middling reader reviews at Amazon.com. Only after reading a few did I realized that jealous nit-picking is evidently a common pastime among your die-hard Dylan enthusiasts. There may be some factual errors in the books, but not enough to allay my enjoyment.) One of the unexpected things I learned from the books is that a large number of Dylan’s songs were not performed live for years, sometimes decades, after they were first recorded and released. I will say that Heylin seems to grow more intemperate as he nears the end of his survey. It is clear that he dislikes Daniel Lanois’ involvement in Dylan’s record-making (on both Oh Mercy and Time Out of Mind, which to my mind are his two best records of the past 30 years), and he seems to really dislike Love and Theft. It’s fine to dislike the records, of course, but are they really so much worse than the dross Dylan dribbled out through much of the 1970s and 1980s? Not to my mind. But every man, Heylin included, has his ups and downs, and a little distemper cannot overshadow what is a fine achievement. I’m grateful to have these volumes on my shelf. Dylan aficionados will have picked up on the fact that the titles of Heylin’s books are taken from phrases in “Tangled Up in Blue”. If, as I fondly hope, Dylan has a long life and dozens of albums still ahead of him, future volumes in this series might well include A Different Point of View: Songs of Bob Dylan, or In the Spotlight so Clear: Songs of Bob Dylan, or perhaps Heading for Another Joint: Songs of Bob Dylan, and even, I suppose, someday, Something Inside of Him Died: Songs of Bob Dylan. Not only am I a busy father, but I am also a busy godfather. It is sometimes hard for me to keep track of all my godchildren, but I am pretty sure I could field a baseball team by now. Our team would probably be called the Discalced Crusaders, or something similar. Anyway, one of the pleasures of being a godfather is that I get to give gifts to my godchildren from time to time, when the fancy strikes me, and I am fond of giving books. The trouble is that when I go to my local Catholic bookstore and peruse the books for kids and young adults (my godchildren range in age from 4 to 21) I can’t help noticing something: there’s a lot of crap. So I am looking for recommendations of good Catholic books for kids and teenagers. (I don’t have as much trouble with adults.) Suggestions are most welcome. 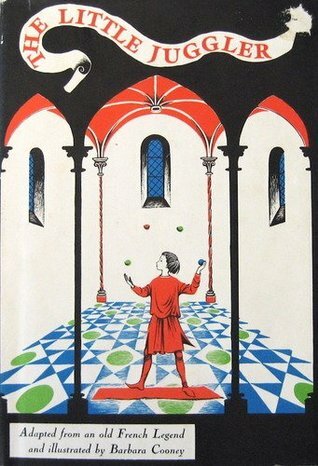 The Little Juggler was adapted by Barbara Cooney from a French legend, and was first published in 1961. It tells the story of a young boy in medieval Europe who wants to serve God but only knows how to juggle. The story has been adapted, with some differences, by others (such as in Tomie dePaola’s The Clown of God), but this one is the best. The illustrations are wonderful, and the text is elegant and moving. 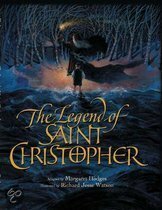 Margaret Hodges has adapted a few classic tales about saints for children, and I really like her Legend of St Christopher. The story, which comes from The Golden Legend, tells the story of a strong man who wants to serve the world’s most powerful king. He first serves in the court of a great ruler, then he serves the devil, and finally he serves Christ. The illustrations are superb; they were done by Richard Jesse Watson. 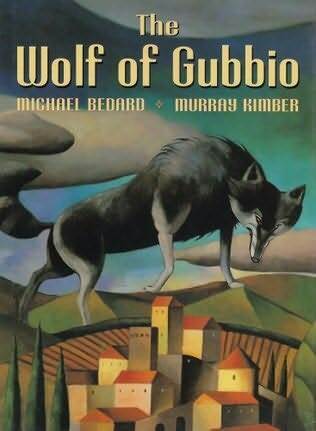 There are shelves of books about St Francis, but my favourite (of those I have seen) is The Wolf of Gubbio by Michael Bedard, with illustrations by Murray Kimber. It tells the story of how Francis tamed the wolf of Gubbio. Once again, the illustations are a big part of the draw here; they are fantastic. One begins to discern the limits of my knowledge: these are all picture books suitable for young children. They are all narrative and quasi-legendary, rather than Biblical or catechetical. I’m not saying that’s a problem, but it is a limitation. I’d be grateful for recommendations of other good books for Catholic children.